Made almost in one piece. You only need to add the ruffle later. 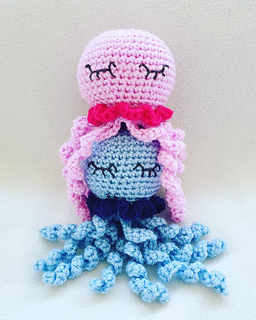 In my pattern the tentacles are crocheted to the body, so its safer for little babies. I also didnt use safety eyes. Instead the eyes can be embroidered or skipped at all. Skills needed: single crochet, half double crochet, double crochet, working in the back and front loops.